The 2016 SsangYong Korando has been updated with an all-new engine designed for better power delivery along with less fuel consumption and CO2 emission. The new e-XDi 2.2-litre diesel engine produces 178PS of power and 400Nm of torque - 19.4 per cent more power and 11 per cent more torque than the current generation Euro S 2.0-litre diesel that powers the SUV crossover. With fuel economy claimed to be improved from 20kmpl to 22.6kmpl, the CO2 emissions have reduced from 147g/km to 139g/km. The car comes in three trims, namely SE, EX and ELX. While the SE and EX trims come with either two-wheel or four-wheel drive, the ELX trim is offered only with four-wheel drive. The new Korando comes with a five-year unlimited mileage warranty. The major change on the exterior is the clear glass indicators. The top-end ELX trim gets a piano black radiator grille with chrome detailing and 18-inch diamond cut alloys. The SE trim runs 16-inch alloys while the EX gets 17-inch alloys. The high mounted LED tail lamps continue to feature in the Korando EX. On the inside, the new SsangYong Korando get an upgraded infotainment system as standard. The SE trim comes with an MP3 player with Bluetooth, iPhone /iPod connectivity, electric windows and six air bags. The EX trim gets a 7-inch touchscreen with integrated rear parking camera, audio streaming from smart devices, automatic air conditioning, heated front seats and rear spoiler. Manual transmission is standard across all three trims but the ELX can be optioned with an Aisin 6-speed automatic transmission. Other features in the top-end variant include TomTom navigation, USB memory slot, AUX and HDMI ports, heated rear seats (in addition to heated front seats), six-way power adjustable driver seat, leather upholstery and lots of chrome detailing on the inside too. The Korando 2.2 SE (two wheel drive) is priced at £15,995 (Rs 15.90 lakh approx). Prices for the 2016 Korando go up to £22,495 (Rs 22.36 lakh approx) for the 2.2 ELX 4x4 automatic. SsangYong cars are manufactured in South Korea by SsangYong Motors, 73 per cent of which is owned by India's Mahindra & Mahindra. 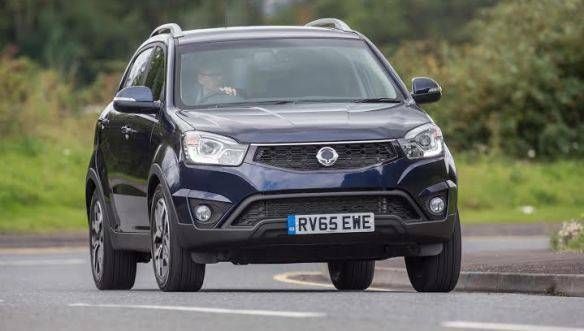 "This is a significant evolution for the Korando," says Paul Williams, CEO of SsangYong Motor UK. "The power upgrade brings greater refinement, while the car continues to deliver unrivaled levels of equipment and value. No other car in its class has such a strong towing capability, nor such a comprehensive warranty for complete peace of mind."